Parade spectators (above, from left) Morgan and Carol Ann Casebolt, along with Roxanne and Cole Phen, show their Fourth of July spirit Photo by Bryan Kneiding / The Signal. iding on floats, in automobiles, on horseback, on skates and bicycles, and even in wheelchairs, hundreds of representatives of various organizations and groups in the Santa Clarita Valley marched down San Fernando Road Saturday morning to honor the nation's birthday and Santa Clarita at the annual Santa Clarita Fourth of July Parade. Marchers representing dozens of local organizations, from church groups to the boy and girl scouts, honked their horns and waved miniature flags to the thousands of onlookers who were lined up along the parade route, which went from Hart Park to Newhall Park. The parade has been held annually in Downtown Newhall since 1932, except during some of the war years. It has continued to be a tradition in the SCV because it honors the valley and instills it with a sense of community, organizers said. "It's a way for the entire community to come together to celebrate not only the nation's birth but everything that's good about the Santa Clarita Valley," said Leon Worden , the chairman of the parade committee and the business editor at The Signal. "The parade was hosted by downtown Newhall merchants for many years because part of the purpose of having the parade in Newhall has always been to bring people into the area who will come back and shop," said Worden. Despite the thousands of potential customers lining the streets of downtown Newhall on Saturday, however, many area shops that are normally open for business on Saturdays displayed "Closed" signs in their shop windows. Several pioneer members of the community also rode in the parade to represent the beginning of the century, in keeping with the parade's theme of "The Century in Review." Former schoolmates Lydia Manrequez, Evangeline Landis and Gladys Laney, who attended Newhall Elementary School in the 1910s, rode in the parade together. Landis, 92, who lived in the SCV until she was 21, is now a Glendale resident, but she still considers the SCV to be her hometown. "It's where my roots are," Landis said. Local politicians, city council members and members of equestrian groups throughout the SCV also rode in the parade. As a first-time event, a posse of horseback riders with the Million Horse March, led by Signal columnist and equestrian John Boston, started off the parade festivities. Several alumni from Hart High School's class of 1949, Barbara and Ralph Brown and Joan Steere, also rode in the parade together. "So much of history is not recognized and these people were here when there was nothing in the area," said Tom Frew IV, a member of the parade committee. "Not only were they pioneers of the era, but they're still here to be recognized." Trophies for the best floats and entries were given out for first-, second- and third-place winners of the parade. Winners included the YMCA Y-Guides and Princesses, who won for the best overall entry, the Sweepstakes, with their float that was decorated with tepees; the U.S. Postal Service, who won for best of theme with their float featuring a performing Elvis Presley and Marilyn Monroe look-alike; and the SCV Congress of Republicans, who won the best decorations category with their float, which was decorated with a stuffed elephant. Stan Sierad, who has been nominated as the SCV Senior of the Year and Man of the Year, served as the parade's grand marshal. 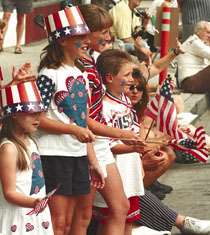 "It's an extreme honor," said Sierad, who added that the importance of Fourth of July parades is for people to honor the country and to reflect upon those who gave them freedom. Sponsors of the parade included The Signal, Lennar Corp., Strategies For Success Marketing, Saratoga Engraving, Academy Addressing and Mailing, and All American Marketing Group. ©1999, THE SIGNAL · USED BY PERMISSION · ALL RIGHTS RESERVED.